(Persian Aškānīān), Parthian dynasty which ruled Iran from ca. 250 B.C. to ca. 226 A.D.
ARSACIDS (Persian Aškānīān), Parthian dynasty which ruled Iran from about 250 B.C. to about 226 A.D.
Our sources on the ancestry of the eponymous founder of the dynasty, Arsaces, vary irreconcilably. He is introduced as a bandit who seized Parthia by attacking and killing its satrap, Andragoras (Justin 41.4; Ammianus Marcellinus 23.6.2); as a Bactrian who found the rise of Diodotus unbearable, moved to Parthia, and securing the leadership of the province, rose against the Seleucids (Strabo 11.9.3); or as a Parni chief of the Dahae Sacians, who conquered Parthia shortly before Diodotus’ revolt (ibid., 11.9.2). A fourth account alleges that “the Persian” Andragoras whom Alexander left as satrap of Parthia was the ancestor of the subsequent kings of Parthia (Justin 12.4.12). A fifth version had been provided by Arrian in his Parthica, now lost, which was epitomized on this point by Photius (Bibliotheca 58) and the twelfth-century Syncellus (Corpus scriptorum historiae Byzantinae XIII, ed. W. Dindorf, Bonn, 1829, p. 539). Photius’ epitome runs as follows: “Arsaces and Tiridates were brothers, descendants of Phriapites, the son of Arsaces [Syncellus: the brothers “were allegedly descendants of the Persian Artaxerxes”]. Pherecles [Syncellus: Agathocles], who had been made satrap of their country by Antiochus Theus, offered a gross insult to one of them, whereupon ... they took five men into counsel, and with their aid slew the insolent one. They then induced their nation to revolt from the Macedonians and set up a government of their own.” Finally, the Iranian national history traced Arsaces’ lineage to Kay Qobād (Ferdowsī, Šāh-nāma VII, p. 116; Ṭabarī, I, p. 710), or to his son Kay Āraš (Ṯaʿālebī, p. 457), or to Dārā the son of Homāy (Ṭabarī, I, p. 704; Bīrūnī, The Chronology, p. 118), or even to the famous archer, Āraš (Šāh-nāma VII, p. 115; anonymous “authorities” apud Bīrūnī, op. cit., p. 119). These reports reflect developments in political ideologies. Humble origin and robbery are folkstories told also of Cyrus, Sāsān, and other dynastic heroes. The association with Āraš the archer was occasioned by similarity in names and the fact that Arsaces is figured on Parthian coins as a bowman (cf. A. v. Gutschmid in ZDMG 34, 1880, p. 743), although the bow was always regarded as a royal symbol. “The Persian Artaxerxes” in Syncellus has generally been taken to mean Artaxerxes II because Ctesias said (apud Plutarch, Artoxares 2) that he was called Arsaces prior to his coronation (A. v. Gutschmid, Geschichte Irans und seiner Nachbarländer, Tübingen, 1888, p. 30, and others). But this ignores the fact that Artaxerxes I also was called Aršak/Arsaces, Babylonian Aršu (A. Sachs, “Achaemenid Royal Names in Babylonian Astronomical Texts,” American Journal of Ancient History 4, 1979, pp. 131ff.). The tradition that Arsaces was a Parni chief is supported, as R. N. Frye has noticed (The History of Ancient Iran, Munich, 1983, p. 206), by a statement in Bundahišn (35.43f.) according to which Dastān (= Zāl), “Prince of the Sacas” and Aparnak, Lord of Aparšahr (later Nīšāpūr) were descendants of Sām: “Aparšahr is thus named because it is the land of the Aparnak” (corrected translation in Frye, loc. cit., with n. 3). By the middle of the third century B.C., the Parni appear to have been assimilated to the Iranian Parthians: They adopted the latter’s name, bore purely Iranian—even Zoroastrian—names (Lassen, Indische Altertumskunde II, Bonn, 1847, p. 285 n. 3, could connect the name of Arsaces’ father, Phriapites, with an Avestan *Friya pitā “father-lover” = Greek Philopatros). On his coins, Arsaces wears Sacian dress but sits on a stool (later ampholas) with a bow in hand, as Achaemenid satraps, such as Datames, had done before. He deliberately diverges from Seleucid coins to emphasize his nationalistic and royal aspirations, and he calls himself Kārny/Karny (Greek Autocratos), a title already borne by Achaemenid supreme generals, such as Cyrus the Younger (see for details M. T. Abgarians and D. G. Sellwood, “A Hoard of Early Parthian Drachms,” NC, 1971, pp. 103ff.). Later Parthian kings assumed Achaemenid descent, revived Achaemenid protocols (J. Neusner, “Parthian Political Ideology,” Iranica Antiqua 3, 1963, pp. 45ff. ), and Artabanus III, who named one of his sons Darius (Dio Cassius 59.27), laid claim to Cyrus’ heritage (Tacitus, Annals 4.31). On the whole, then, onomastic, numismatic, and epigraphic considerations point to the conclusion that the Parthian dynasty was “local, Iranian by origin;” on this ground “the Zoroastrian character of all the names of the Parthian kings, and the fact that some of these names . . . belong to the "heroic background" of the Avesta,” afford logical explanation (G. V. Lukonin in Camb. Hist. Iran III/2, 1983, p. 687). 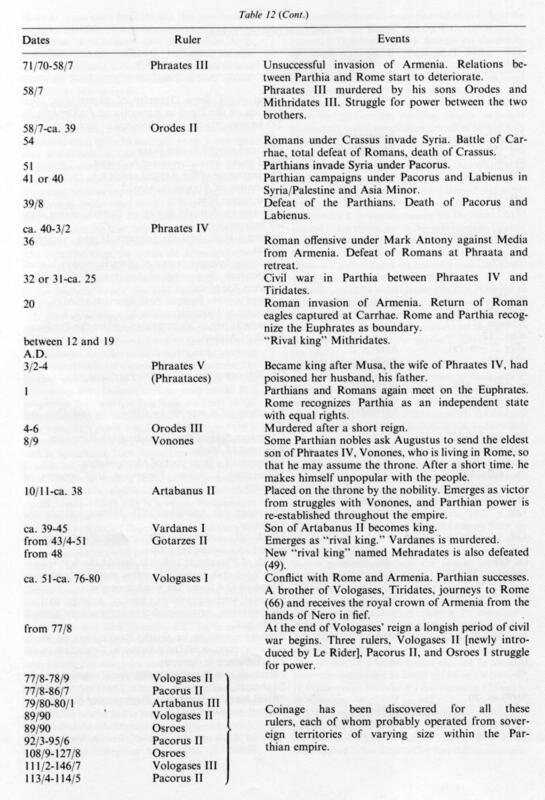 Parthia and Rome. Disorder persisted after the death of Mithridates II in 88/7 B.C., and the Armenians seized the opportunity to reconquer the “seventy valleys” they had ceded to the Parthians. At this time a series of monarchs ruled in the Parthian empire, such as Gotarzes, Orodes I, Sinatruces, and Phraates III, of whom little more than names is known. (Cf. Schippmann, Grundzüge der parthischen Geschichte, pp. 33f. Also Orodes and Mithridates, sons of Phraates III, who struggled for power after having murdered their father, are obscure figures. In 54/3 B.C. Mithridates defeated his brother, averting a fraternal strife, which would surely have diminished the chances of success in the impending great conflict with Rome. 2. Parthian society from the third century B.C. to the third century A.D. As a result of archeological research, particularly the work carried out by the Russians in Turkmenistan and Chorasmia, it must now be accepted that political entities of some considerable size existed in Parthia and Margiane, i.e. in the territory of the present-day SSR Turkmenistan, as early as the first millennium B.C. and not just from the times of the Achaemenids or the Seleucids (see V. M. Masson and V. I. Sarianidi, Central Asia, London, 1972, pp. 155ff.). The existence of fairly large towns can also be assumed, such as Samarkand, Marv, Elken Tepe, and Yaz Tepe, to name only a few. For the most part, however, there were villages of varying sizes, and large irrigation systems played a significant role (Polybius 10.28, pp. 3ff., Justin 41.5.4). Life in southern Turkmenistan was dominated by big landowners who had large numbers of serfs at their disposal. Beyond this there was certainly a considerable number of slaves, although village communities with free peasants also existed. 4. 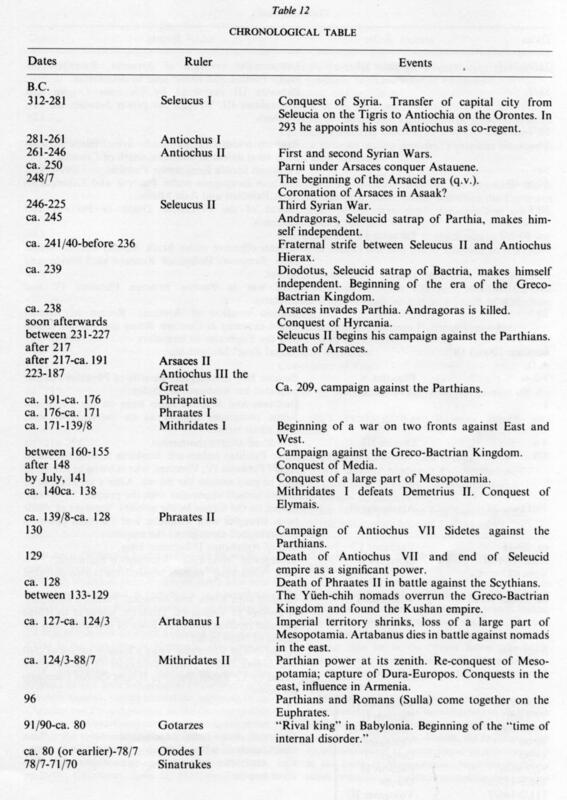 The army in the Parthian empire. Unfortunately there is no comprehensive account of the Parthian army. The numerical size of the Parthian army can only be estimated approximately. At the battle of Carrhae: 10,000 cavalry are said to have taken part on the Parthian side (see Plutarch, Crassus 17; Dio Cassius 41.12) and in the struggle against Mark Antony in 36 B.C. their cavalry reportedly numbered as many as 50,000 (Justin 41.2.6). Probably the latter figure represented their maximum strength. The start of Arsacid minting. This may be placed soon after the middle of the 3rd century B.C., when the internecine conflict between Seleucus II and his brother Antiochus Hierax opened the way for the eruption of the nomadic Parnians into the satrapy of Parthava (after which they became known as Parthians). The subsequent establishment of the Parthian empire took place in two main stages: under Mithradates I (ca. 171-139/38 B.C.) and under Mithradates II (ca. 124/23-88/87 B.C. ), when the territorial expansion was completed and the need for provision of adequate circulation media became acute. Arsacid minting ceased when the Sasanians seized power in A.D. 224. Thereafter the typology was entirely different, but not all the denominations were changed; the Attic drachm was retained. Legends, names, epithets. The legends are usually on the reverse and always in Greek. 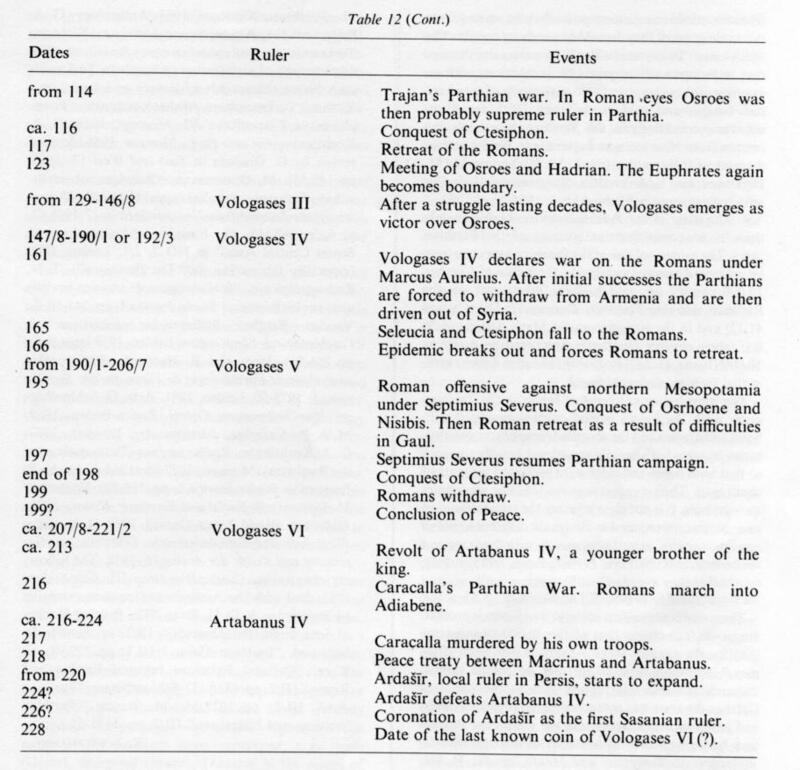 From the reign of Vologases I (ca. 51-ca. 76 or A.D. 80), additional legends in Parthian script appear exclusively on drachms first sporadically, and later on more frequently. They are limited to the king’s name and title, and when on the obverse are always abbreviated. Imperial coinage, local currency, and circulation. 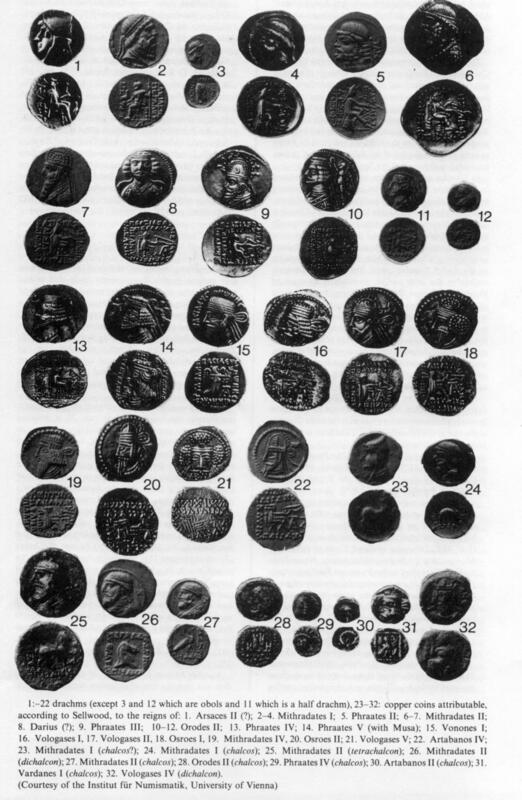 In addition to the imperial currency, copper coins for local use were struck in the city of Seleucia on the Tigris, which held a special minting franchise in Arsacid times. Although these coins can be classed as autonomous on a narrow definition, they are always coordinated with the imperial issues. Under Phraates IV, Susa enjoyed the same privilege in 31/30-27/26 B.C. The indigenous dynasties which governed Elymais. 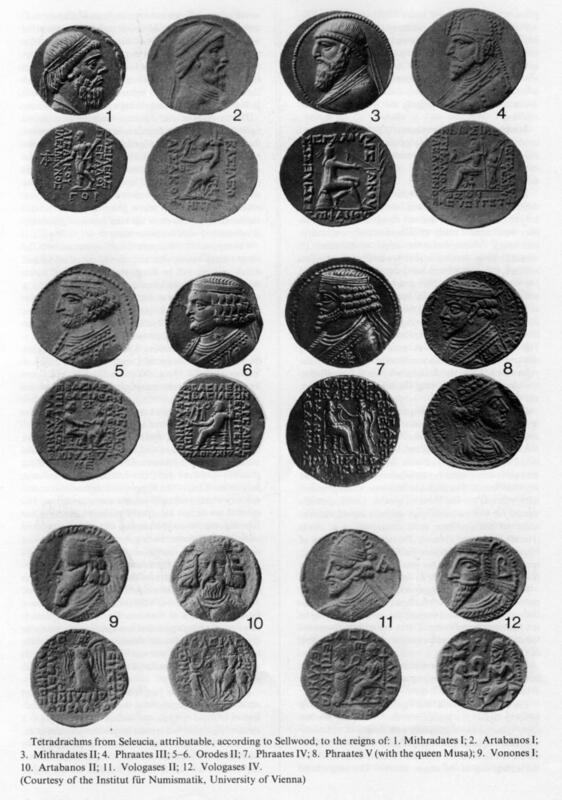 Characene, and Persis also exercised the right of coinage and largely displaced the Arsacid currency from their domains. Their mints were at Susa and Seleucia on the Hedyphon in Elymais, at Spasinou Charax in Characene, and at Staxr (Eṣṭaḵr) near Persepolis in Persis. These so-called “sub-Parthian” dynasties had begun to mint coins well before the Parthian conquest (in Persis as early as the beginning of the 2nd century B.C. ); they continued to do so until the Sasanian conquest. In Elymais and Characene, only copper was minted from the first half of the 1st century A.D. onward (mainly drachms in Elymais and tetradrachms in Characene). On the other hand, the local coinage of Persis is consistently pure silver (drachms and fractions thereof); in respect of design and script it prefigures the Sasanian coinage. Elsewhere the typology is initially Hellenistic, as in coins of Characene which often portray Heracles in the Greco-Bactrian style, but Parthian elements emerge in the later period, particularly in coins of Elymais. In contrast, the coins of Persis, the stronghold of Achaemenid tradition, are always purely Iranian in type. The legends are predominantly in Greek, but are in Parthian on the coins of Elymais from the middle of the 1st century A.D. onwards. On the coins of Characene legends in Aramaic only appear at the end of series, whereas on the coins of Persis the legends are at first in correct Aramaic and later in the Middle Persian script as used under the Sasanians. In eastern Iran, in Sacastene, the Pahlavas, a local dynasty of Parthian origin and perhaps of the Sūrēn family began to overstamp coins with the name Otannes at the end of the 1st century B.C., and later to produce imitations of Arsacid drachms. Evidence concerning their religion remains scanty, considering the length of their rule. It is possible nevertheless to trace some important developments in observance, notably in the fire cult. Temple fires had been established only late in the Achaemenian period, and it is possible that the Parthian sacred fire of Ādur Burzēn-Mihr (q.v.) was the first one to enjoy more than local fame. It is likely that the Arsacids deliberately promoted its legendary sanctity and encouraged pilgrimage to it, as later Shah ʿAbbās encouraged pilgrimage to Mašhad in the same region, for religious, political, and economic motives. Further, the first known regnal fire seems to be that recorded by Isidore of Charax (Parthian Stations 11): “Beyond is Astauene...and the city of Asaak, in which Arsakes was first proclaimed king; and an everlasting fire is guarded there.” The custom of establishing a temple fire at a king’s coronation appears to have been a regal development of the age-old one of a new householder kindling his hearth fire; and it spread under the Arsacids to their vassal-kings (see Nāma-ye Tansar, ed. M. Mīnovī, Tehran, 1932, p. 22, tr. M. Boyce, Rome, 1968, p. 47 with pp. 16-17). See also for the Nisa documents Ph. Gignoux, Glossaire des inscriptions pehlevies et parihes, Corp. Inscr. Iran., Supplementary Series I, London, 1972, p. 43 (bibliography), 45-68 (glossary). I. M. Diakonoff and V. A. Livshits, Parthian Economic Documents from Nisa, ed. D. N. MacKenzie, Corp. Inscr. Iran. II/II, London, 1976-79, Plates I-III; London, n.d., Texts I (with complete bibliography). As an indication of their imperial aspirations, the Parthians established their own dynastic era, beginning with the vernal equinox (in Babylon with 1 Nisan = 14 April) 247 B.C. Long doubted, the historicity of this era was proved by a Babylonian tablet equating the Seleucid year 208 with 144 of the Arsacid era (G. Smith, Assyrian Dictionary, London, 1875, p. 389). Since then numerous documents attesting to the wide use of the era have been discovered from Nisa, Dura-Europos, and other places. In purely Iranian contexts (as in recovered Nisa ostraca from ca. 100 B.C. to A.D. 13), the Arsacid era was used without specified appellation, and with Zoroastrian month and day names. A good example is the stele of Xwāsak, whom Artabanus (Ardawān), the last Parthian Great King, appointed satrap of Susa; this is dated to “year 426, month of Spandārmat, day of Mihr [= 14 September 215]” (W. B. Henning, “The Monuments and Inscriptions of Tang-i Sarvak,” Asia Major, N.S. 2, 1952, p. 176). After the conquest of Mesopotamia, its people were allowed to use a double date, with Babylonian or Macedonian months, first mentioning the Royal (i.e. the Arsacid) reckoning and then the “former” or “ancient” (i.e., the Seleucid year) (C. F. Lehmann-Haupt, “Zur Arsakiden-Ära,” Klio 5, 1905, pp. 128-30. E. H. Minns, “Parchments of the Parthian period from Avroman in Kurdistan,” Journal of Hellenic Studies 35, 1915, pp. 31-36; F. X. Kugler, Sternkunde und Sterndienst in Babel II/2, pt. 2, Münster in Westfalen, 1924, pp. 443-63). Thus a Greek letter sent by Artabanus III in A.D. 21 to Susa was dated by the royal scribe to “year 268” but its receipt was dated “in the year 268 according to the royal reckoning, in the year 333 according to the ancient numbering” (B. Welles, Royal Correspondence in the Hellenistic Period, New Haven, 1934, no. 75 [p. 301]). And a parchment contract in Greek from Dura-Europos is dated “in the reign of Arsaces, King of Kings,..., year 368 according to the reckoning of the King of Kings but according to the former reckoning 432, on the twenty-sixth day of the month Daesius” (M. Rostovtzeff, Yale Classical Studies 2, 1931, pp. 7-8, 39ff.). The use of the Macedonian and Babylonian months meant that a single Parthian year could be given two beginnings: a Macedonian-style New Year and a Babylonian New year several months later. The interpretation of the Arsacid era has been much debated (A. D. H. Bivar in Camb. Hist. Iran III/1, 1983, pp. 28-29), but the only occasion in the first years of the Arsacid rule sufficiently important to have been counted by Parthian kings as an epoch-making event was the coronation of Arsaces, the eponymous founder and deified hero of the dynasty. Upon mounting the throne, each Iranian king founded a royal fire, counting his regnal year from that moment (Diodorus 17.114; A. Christensen, Revue des arts asiatiques 10, 1937, p. 127). Arsaces, too, founded his royal fire at his town of Aršak or Asaak (near Qūčān) when he was crowned, but his fire was kept burning throughout centuries (Isidore of Charax, Parthian Stations 11 [ed. and tr. W. H. Schoff, Philadelphia, 1914]), thereby providing the means for an uninterrupted dynastic era (A. von Gutschmid, Geschichte Irans und seiner Nachbarländern, Tübingen , 1888, p. 31). The Parthian rule lasted 474 years, longer than any dynastic period in Iranian history. Throughout this period, the Arsacid era (q.v.) and the Seleucid era which preceded it by 64 years, were both in use, and so it would have been easy to recall that the Ctesiphon accession of Ardašīr I occurred in the 538th year of the Seleucid era and in the 474th year of the Arsacid era. Yet post-Sasanian sources give various figures for the duration of the Arsacid rule, which may be divided into the following categories. 1: 200 ud and (200 odd) years (Great Iranian Bundahišn, Codex DH, p. 109 lines, 10-11 [Tehran, 1971], TD1, p. 207, lines 1-2 [Tehran, 1971], TD2 p. 240, lines 4-5; Ferdowsī: “sāl-i dovīst (some two hundred years)” (Šāh-nāma VII, p. 116); both may be for 203 years, see A. Sh. Shahbazi, “The "Traditional Date of Zoroaster" Explained,” BSOAS 40, 1977, p. 27 n. 19. 2: 266 years, with variants (Šāh-nāma-ye Abū Manṣūrī apud Bīrunī, The Chronology, p. 117; Ṭabarī, I, pp. 706 and 813; Masʿūdī, Tanbīh, p. 97; Baḷʿamī, Tārīḵ, p. 874; Moqaddasī, III, p. 155); this frequently recorded tradition was the official Sasanian reckoning, as Masʿūdī says (see below), and is found also in Agathias (270 years: History 4.24) who used Sasanian royal chroniclers (ibid., 4.30.2-5). 3: 284 years, with slight variants (Masʿūdī, Tanbīh, p. 96; Indian Bundahišn 34.9). 4: 400 years, with variants (Baḷʿamī, Tārīḵ, p. 874; Nāma-ye Tansar, ed. M. Mīnovī, Tehran, 1311 Š./1932, p. 43; Moǰmal al-tawārīḵ, p. 59 [411 years]; Moqaddasī, loc. cit.). 5: 523 years, with variants (Ṭabarī, I, 813, hence Baḷʿamī, Tārīḵ, p. 874; Abu’l-Faraǰ Zanǰānī apud Bīrūnī, The Chronology, p. 119). The last category is of non-Iranian origin, as Ṭabarī specifies, being clearly based on Syrian sources using the Seleucid era: Alexander was usually claimed as the initiator of the Seleucid era (hence the era of Alexander), and was assigned a reign of 14 years (Shahbazi, op. cit., pp. 27ff. ); since Ardašīr’s Ctesiphon coronation occurred “538 years after Alexander” (Agathias 4.24), one subtracted his reign from this number and obtained (537-14 = ) 523 years for his successors, the Petty Kings (Pahl. kadag-xwadāy, Ar.-NPers. molūk al-ṭawāʾef). The fourth category is a rough estimate by historians unconvinced of the authenticity of the official reckoning. The third group is a re-adjustment of the figure 266 in a scholastic version (Shahbazi, op. cit., p. 30). The first two categories are, however, based on sound historical—albeit unauthentic—traditions. Masʿūdī (Tanbīh, pp. 97f.) and Bīrūnī (cited by S. H. Taqizadeh, BSOS 9, 1937, p. 125) have noted the great difference of opinion between the Iranians and other nations concerning the post-Alexander chronology, and they have accused Ardašīr of having distorted the facts. “One of the state and religious secrets of the Iranians,” says Masʿūdī, is that Zoroaster foretold that his religion would be disturbed 300 years after him but the religion and empire would be stricken by a calamity at the end of his millennium. Now Ardašīr appeared when only two centuries of the millennium were left, and fearing the approach of the calamity, he “reduced almost by half the 500-year period separating him from Alexander, counting from the petty kings only some rulers with a total reign of 260 years and ignoring the rest. . . And so the chronology was thus officially fixed, and published” (Tanbīh, p. 98). H. Lewy (“The Genesis of the Faulty Persian Chronology,” JAOS 64, 1944, pp. 1977ff. ), S. H. Taqizadeh (“The "Era of Zoroaster",” JRAS, 1947, pp. 33ff.) and W. B. Henning (Zoroaster: Politician or Witch-doctor?, Oxford, 1951, pp. 37ff.) have explained this “secret” more convincingly: under the Sasanians the Seleucid era had come to be identified as the era of Zoroaster, and Alexander had been placed 258 years after Zoroaster; the appearance of Ardašīr in the 538th year of the Seleucid era was then re-interpreted as his rise in the 538th year of the millennium of Zoroaster; of these 538 years, 258 separated Zoroaster from Alexander and 14 belonged to the latter; so (538âŠδ258 + 14 = ) 266 years were left for the Parthian period. The Sasanian measure was taken, then, not because the Parthian period was to be reduced, but because the widely used Seleucid era had to be Zoroastrianized. The first category—the importance of which is evidenced by its attestation in two major Iranian sources—has so far remained unexplained. But it is clearly based on the re-interpretation of the Arsacid era (q.v.) as the epochal year of the millennium of Zoroaster: Ardašīr’s Ctesiphon coronation was in the (247 + 227 = ) 474th year of the Arsacid era; allowing 258 years for the interval between Zoroaster and Alexander, and assigning 14 years to the latter, one obtained (474âŠδ258 + 14 =) 202 years for the Parthian period. This Zoroastrianization of the Arsacid era must have been the work of the Parthian families who resented the Sasanian re-interpretation of the Seleucid era as the “era of Zoroaster,” so they countered claiming that their era had been initiated by Zoroaster. In this way they sanctified their dynastic symbol at the expense of sharply reducing the period of their rule. Third dynasty of Armenia (in Armenian, Aršakuni), from the first to the mid-fifth century. The preceding dynasty of the Artaxiads became extinct about A.D. 12, amid a secessionist chaos caused by the perennial struggle of Iran and Rome over Armenia—the second throne, after Media, in the Iranian scheme of vassal kingdoms. It was then that the ex great king of Iran, Vonones I became king of Armenia. After him, seven Arsacid princes from Parthia came at different times to occupy the Armenian throne, interchangeably with six others, candidates of Rome. A compromise was finally attempted in 63 (Treaty of Rhandeia). An Arsacid, Tiridates I, was recognized by both empires as king of Armenia. Roman “friendship” was imposed upon him—and in 66 he journeyed to Rome to be crowned by Nero—and, at the same time, as a Parthian prince, he was bound to accept the family ascendancy of the head of the Arsacids, the great king. The balance thus established between political and dynastic allegiance proved, however, precarious. Dynastic allegiance often became political as well, and Armenia continued to oscillate between the two rivals. 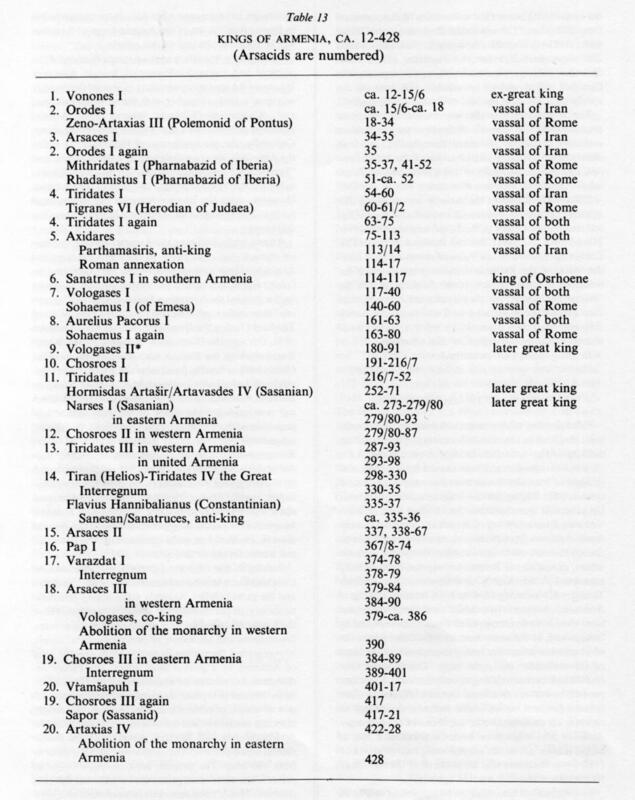 None of the first eight Arsacids who reigned in Armenia founded a line of kings; it was left to the ninth, Vologases (Vałarš) II (180-191), to achieve this: his posterity of thirteen kings formed the Armenian Arsacid dynasty (Table 13). Idem, “Quidam Narseus? A note on the Mission of St. Nerses the Great,” Armeniaca. Mélanges d’études arméniennes, Venice, 1969. J. Doise, “Le partage de l’Arménie sous Théodose 1er,” Revue des études anciennes 7, 1945.